Sony Alpha DSLR-A380. Click to see a larger image. Sony today announced three new digital single-lens reflex (SLR) cameras targeted at consumers interested in transitioning from point-and-shoot cameras. 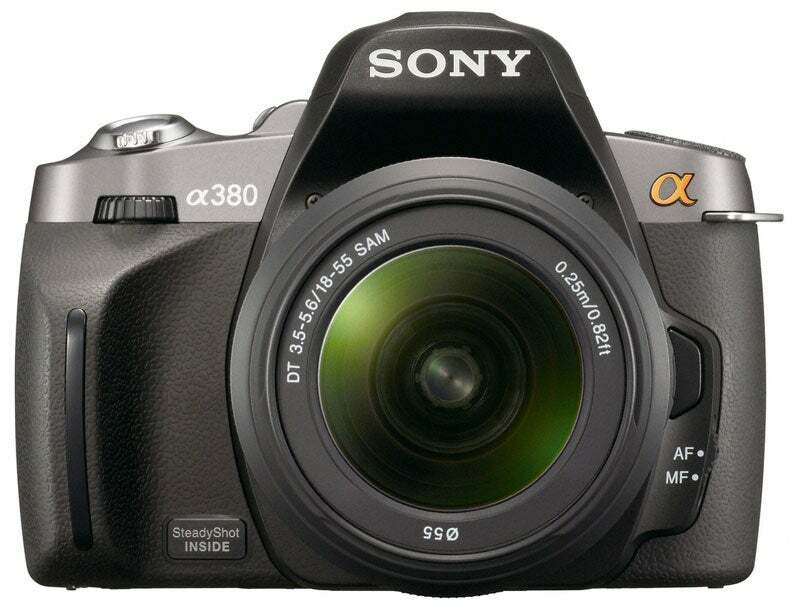 Priced at $550, the Alpha DSLR-A230 replaces the A200 as Sony’s entry-level DSLR. The $650 Alpha DLSR-A330 replaces the A300. Both the A230 and A330 feature 10.1 megapixel resolutions. The Alpha DSLR-A380 replaces the A350. Priced at $850, the A380 has a 14.2 megapixel resolution. The DSLR-A330 and A380 have tilt screens. All three cameras each have an APS-C size CCD sensor, a Bionz image processor; a lens mount for Sony, Minolta, and Konica Minolta auto focus lenses; two memory card slots (SD and Sony Memory Card); a built-in pop-up flash; a hot shoe; image stabilization built into the body; and a 2.7-inch LCD. The A330 and the A380 have pull-out LCDs; the A230 does not. The cameras feature a new software interface that aims to make it easier for inexperienced SLR users to understand and adjust camera settings. For example, the aperture and shutter speed settings each use a horizontal scale with iconic representations of the effect a setting will have on a picture. Moving the scale towards, say, the running man icon on the shutter speed scale lets the user know that the camera is being set to better handle action shots. The software interface can also be displayed using one of four different color combinations. Sony's new menu system makes it easy for novices to understand camera settings. Each camera comes with an 18-to-55mm F/3.5 to 5.6 lens; the cameras are not available as body only. Sony also offers each camera in a two-lens kit, which includes the 18-to-55mm lens and a 55-to-200mm F/4 to 5.6 telephoto lens. Prices for the two-lens kit are $750 (A230), $850 (A330), and $1,050 (A380).The telephoto lens is $230 if purchased separately. 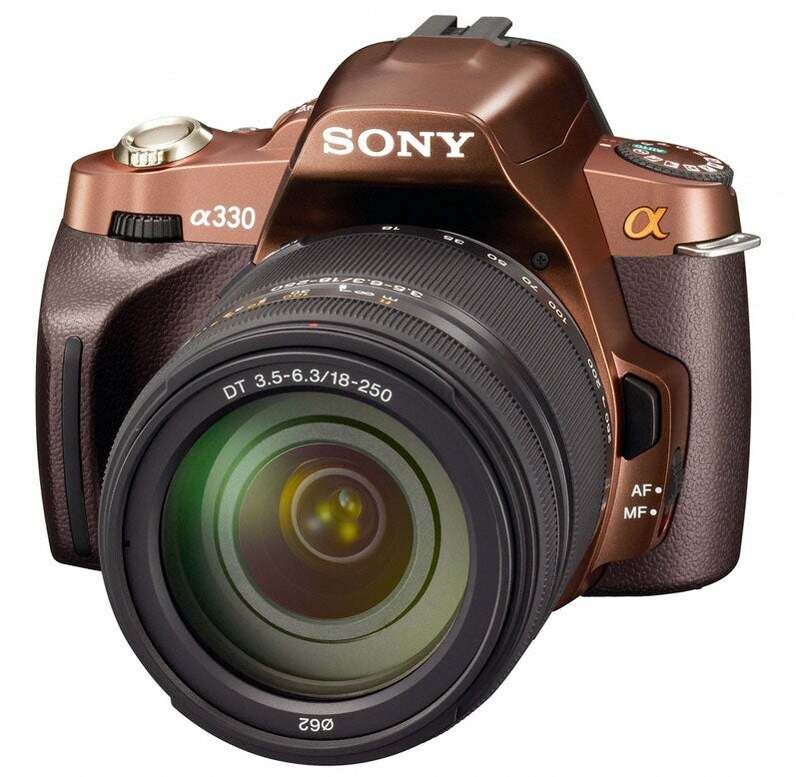 Sony Alpha DSLR-A330 in brown. Click to see a larger image. The cameras have HDMI video out for previewing images on a HDTV. However, the three new Sony cameras do not have the capability to record video. The A330 is available in black or brown. The A230 and A380 are available in black only. The cameras will be available in July.